Experience Sólheimajökull glacier from land and its iceberg filled lagoon. This excellent combo gives you the full glacier experience. Get the best bang for your buck by combining a kayaking tour on the Sólheimajökull glacier lagoon with a Glacier Walk. After meeting your expert guide at the Icelandic Mountain Guides basecamp next to the Sólheimajökull parking lot, you will get geared up with a drysuit and paddle for your kayaking adventure. 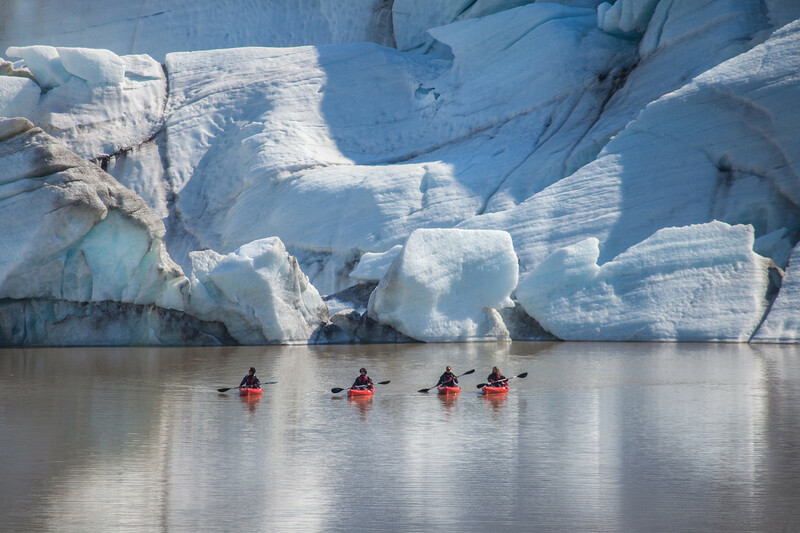 Following a short tutorial, you will set off on your sit-on-top kayak and paddle on the calm, iceberg filled lagoon. During the hour-long tour, you will witness stunning icebergs and a view of the glacier that is inaccessible to people on land. Right after kayaking, you will return to our basecamp for a half-hour lunch break before you begin the next activity. To prepare for your Glacier Walk, you will get an ice axe, crampons, harness and short safety briefing from your guide. On the glacier, you will be led through an otherworldly icy landscape of stark contrasts. The blue and white ice mixed with the dark volcanic ash from past eruptions is stunning. You will explore some of the many crevasses and ice sculptures of the glacier and learn about the geology and the history of the area. Both tours are suitable for all skill levels and are led by professional glacier and kayaking guides. You will receive all the necessary safety equipment for each activity. The glacier walk was incredible, the guides were friendly and very informative about the natural formations in the ice. Was one of the best things we did on our trip, absolutely would recommend!! Adventurer of the Week: George Does the Glacier!